According to Porter and Kramer, “shared value could reshape capitalism and its relationship to society.” It does not replace capitalism, rather it refocuses the areas of responsibilities and opportunities a corporation truly can have. Shared value is directly linked to how Sustainability, blended in Business and Government organizations will be the next wave of transformation. Our complete understanding of shared value is still in its genesis, but the potential is obvious and intuitive. It could very well open doors for efficiency and increased productivity. Then, shared value will be recognized as a catalyst for a competitive advantages available for the progressive corporation. Attaining it will require managers to develop new skills and knowledge and governments to learn how to regulate in ways that enable shared value, rather than work against it. A recent political cartoon depicted Obama sitting in a chair. He is swamped by a pack of dogs, eager to receive his affection. The cartoon entitled “vicious media watch dogs” encapsulated the media industry’s criticism in biased reporting. Obviously these “vicious media watch dogs” are diverted from their mission, but we should put this in contrast with what has recently happened to executives at BBC and the decision by the Australian Broadcast Corporation to publicly post its transparency and Sustainability intentions clearly on their website. Now, fewer Americans closely follow political news than in previous election years due to a perception of bias. [i] Sixty percent of Americans perceive a political bias, almost 4 to 1. With 47% those surveyed saying the media are too liberal and 13% saying they are too conservative. Similar results were report by Gallup in the preceding year. Americans are clearly down on the news media this election year, with a record-high six in 10 expressing little or no trust in the mass media’s ability to report the news fully, accurately, and fairly. This likely reflects the continuation of the trend seen in recent years, combined with the increased negativity toward the media that election years tend to bring. This is particularly consequential at a time when Americans need to rely on the media to learn about the platforms and perspectives of the two candidates vying to lead the country for the next four years. Independents and Republicans drive this year’s decline in media trust. The 31% and 26%, respectively, who express a great deal or fair amount of trust are record lows and are down significantly from last year. Republicans’ level of trust this year is similar to what they expressed in the fall of 2008, implying that they are especially critical of election coverage. The corporate owners or sister companies of some of the biggest names in journalism — NBC News, ABC News, Fox News, The Washington Post, The Wall Street Journal, USA Today, Politico, The Atlanta Journal-Constitution and dozens of local TV news outlets — are lobbying against a Federal Communications Commission measure that would require broadcasters to post political ad data on the Internet. Television stations by law must offer political candidates the lowest rates on ads. Broadcasters have argued that by making this information available online and not just at stations, it would hurt their ability to negotiate with other advertisers. Although U.S. media seems to ignore transparency principles, executive commitment across the Atlantic is taking transparency seriously. Because of poor news investigation, BBC is taking transparency to heart by making executive changes. Does Transparency Exist for the U.S. Media? Do special interest groups drive media companies? Does government regulations over campaign laws limit freedom of speech? Are media companies politically engaged for one side over another and simultaneously taking revenues from both sides? Are media companies addressing their audience’s need for information to make educated decisions, such as voting? Is there conflict of interests in balancing information from media companies with alignment to political parties? Are media companies empowered by their audiences or do they manipulate them? Are freelance writers held to the same level of quality and reliability than their staff journalists? Are editors verifying content before publishing and are they effectively executing due diligence? Do media companies embrace similar standards as the League for Women Voters? Do media companies report on self-censorship? Should media companies be held accountable for its perceived bias or keep ignoring it? How do media companies exercise the right to freedom of expression for the individual? As a media company, does it reflect cultural diversity through content for the entire population or is it selective? In contrast, most American media corporations emphasize “green” initiatives and banal slogans like “generalize their concern for the planet”, “that strives to use its power and reach for the public good”, “has earned the distinction of being a public trust”, “while identifying opportunities for energy savings and innovation”. Most American media corporations do not document transparency or indicate usage in their annual Sustainability Reports or websites. Why is transparency not given visibility? As a mechanism for promoting integrity and accountability, Global Reporting Initiative’s (GRI’s) project is both worthwhile and timely. The discussion to be had is not about the legitimacy of GRI’s objectives but the practicalities of how these are to be accomplished. Does the GRI ensure transparency or Sustainability? No, it is only a tool for those companies truly committed to Sustainability. However, adopting this tool is a part of your best practices and is based on fact gathering in your organization. Dr. Peter Drucker once said, “what gets measured gets done.” When a company publicly discloses Sustainability data and goals, measures its progress, then its much more likely to attain those goals. Executive Commitment is a long-term journey with Transparency, Sustainability and Corporate Social Responsibility. It is a leadership role and resolves redefinition of their organization to create an environment that weaves new principles into their corporate culture. Accountability is ownership of responsibility, including a sense of fairness. The U.S. media appears to broadcast a “green” initiative in their organizations without true transparency. A strategy that ignores transparency is reminiscent of the old TV commercial; “where’s the beef?” It appears to be “green” in name only without sharing transparency strategies, objectives or data. Sustainability is not an expendable marketing campaign; rather it’s a refection of benefits established with honest strategic effort, results, and best practices. It must be imprinted into your corporate culture, it should be a long-term commitment and be transparent to the public. It must be interwoven with business strategies. It must engage and build relationships with external organizations. Sustainability is about measurable transformation, internally and externally. Sustainability is more than platitudes and recycling efforts. It should be able to show financial benefits directly relating to waste reduction, conservation, improvement of internal processes and engagement with external publics (i.e., NGOs, Governments, Customers, Suppliers, etc.). Consider the consequences. If they do not change and continue building risk to their brand that could have a financial impact, address the issue and establish self-governing principles or risk government regulations that could have political ramifications, as well. Will American media industry choose self-censorship and turn to using transparency to demonstrate accountability and commitment to fair reporting, regardless of complexity or will it continue to erode trust and foster a perceived agenda that is biased? Are U.S. media companies approaching distrust by betting against public backlash? Look at the well thought out approach in Britain and Australia. In Britain, the decision will rest on the benefits garnered by BBC’s courage to change course for the right reasons. They acknowledge that the hard earned trust of the public is fundamental to British citizen’s presumption to encapsulate integrity in daily news broadcasts. It also shows that ABC has spent considerable time in understanding Sustainability and publicly sharing their strategies. Both BBC and ABC demonstrate clear examples of commitment and responsibility driven by Sustainability. So, will U.S. media recognize benefits of presumption of transparency like their media cousins, or will it be business as usual, based on continued distrust and potential for public backlash? Last month, I wrote a short article concerning the American Leadership in Sustainability. I said; “the United States has been the leader in conserving our planet and its resources. It has recognized our precious resources from its beginning. Our nation’s forethought is founded on the fundamental values of preserving our resources.” Our American vision of Sustainability and understanding conservation of resources, their value, and future needs originally established those laws such as NEPA, that established the Environmental Protection Agency, and subsequent best practices that have developed over the past half century. Let me introduce an example of this philosophy of American ingenuity and meeting the needs of the present with sound innovation. Dr. Donald Sadoway and his team of graduate and doctoral candidates from MIT have invented a new storage battery for wind farms and solar panel generated electricity. As I previously mentioned this month, as Stewards, we must anticipate change for our Future, rather than have the Future change us. That mindset is focused on smart Leadership choices to improve our organizations, our industries and our country. We have the capability and knowledge to bring new solutions to those pesky problems we have today. Why Change to an Efficient Organization? Sustainability? Many corporations are faced with a dilemma. In many cases, the founder of a company may not recognize the need for an organizational vision as business changes. Leadership often tolerates inefficiencies, especially when “fire drills” are often case. Often, leadership they understand the history, inception and evolution of the organization since its founding, to may not have a clear understanding regarding its next steps. Inception & Evolution: This is the period when an idea is transformed into business. It may be a very small organization of one person or expanded to include larger groups to meet the business needs. An organization could vary from “vague” to a clear hierarchy with a “command and control” structure. Oftentimes, organizational evolution develops in the decentralized model. Congeal Phase: This phase is the “critical mass” of the organizational when issues become recognized. There may be a serious decline in sales. Competition, new technologies, a failure to meet the customer needs and expectations, a history of poor product development and introduction or poor marketing may all be contributory factors in reduced sales and be the catalyst for the business owner to change the approach to the business organization. Bureaucratization: The autocratic control of an owner may at times only be changed through the realization that bureaucracy is undesirable and can be a barrier. The policies, procedures and practices of the business may be restrictive and hinder growth, communication or efficiency. The term “bureaucratization” evolves from growing hierarchy and functional differentiation. Differentiation Phase: Promoting products and services that are unique and possess intrinsic values for your Customers are significant in attracting “niche” markets. Stagnation: A business owner may not realize that in order to optimize business value, changes in the way the business is run will be necessary. The delegation of responsibilities, training of staff and implementation of strategic plans may be areas that are not internalized, nor control change. This organizational model, similar to Taylor’s philosophy and methodology, renders work force pathways as limited and erects obstacles for improvement. Litmus Test: Will this organizational evolution address your business needs to meet your competitive environment? Does it provide a process to eliminate waste and variation? Does it provide an alternative for improvement and performance? Still, other management styles focus on expenses, only. This is a very shortsighted approach that can have substantial consequences and even jeopardize the survivability of the company. Beginning in the early 1990s, many corporations selected that option solely based on cost savings. Often times those “savings” evaporated, in context of poor service, poorly educated support staff, service provider’s unrealistic service expectations, cultural and language differences that also hindered business and organizational needs. For the past 5-10 years, those poorly thought out decisions have have been reversed and aligned to marketplace needs. Inception & Evolution: This is the period when an idea is transformed into business. Congeal Phase: This phase is the “critical mass” of the organizational when issues become recognized. . External & Internal Transformation: External leadership who bring new methodologies and enterprise planning to the business can visualize end-to-end organizational improvements, from Suppliers to Customers, provide strategies that sensitive to the environment, enrich brand image, engage with the business community and reap tangible benefits. Innovation: Innovation is assembled from creativity, ideas, strategies, processes, and most important the right human elements and a spirit of entrepreneurship. Innovation can be applied to your existing business environment to increase customer satisfaction, increase profitability, decrease waste and become more in tune with the marketplace. 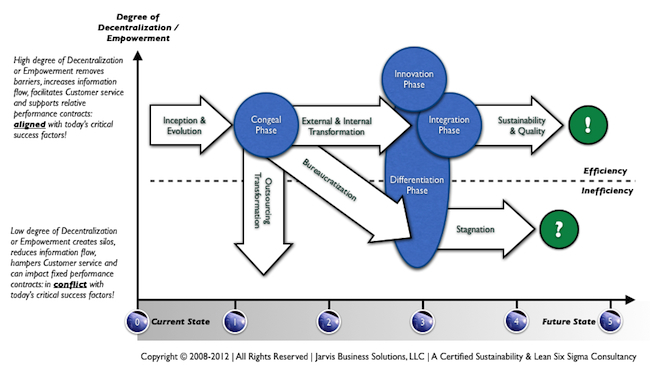 Integration: After Transformation initiatives are executed and implemented, a leader recognizes that seamlessness may not be apparent in the controlled change. So, integration links groups in organizations, based on your new business paradigm and avoiding relapses to “old ways”, to apply their new knowledge in the “new” system with support to its stakeholders and the vision. Litmus Test: Will transformation create opportunities for increased performance, reduced costs, provide for growth of brand and attract quality employees? The results indicate it will provide your organization with those opportunities and establish a Continuous Improvement process to refine and meet your future competitive landscape.